The maturation of Charlie Chaplin’s genius both as a comic actor and film director can be appreciated in three DVD and Blu-ray releases from Curzon Artificial Eye, each film a masterpiece in cinematic hilarity. Having already earned himself a fortune and massive fame with his short films for Keystone, Essnay and Mutual studios, Chaplin used his leverage to pursue ever greater independence. Despite his modest persona of the Tramp, Chaplin was an obstinate and ambitious man who was constantly dissatisfied with existing conditions and unwilling to fit into the frameworks that others provided. Working with Mack Sennett at Keystone, Chaplin rebelled against the madcap pace and the direction of Mabel Normand among others, offering to pay Sennett the cost of his directorial debut Caught in the Rain (1914) if it didn’t make good. But it did. Once in control of his career, Chaplin never let go. 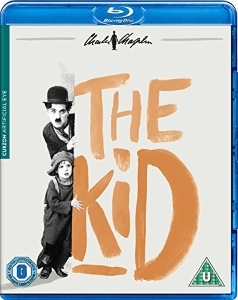 The Kid (1920) was in production for nine months, with Chaplin writing with the camera, demanding a massive number of retakes and entire sequences clipped out if they didn’t serve his vision. Much has been made of the tragic background to the filming. Chaplin felt he had been swindled into an unhappy marriage with young actress Mildred Harris. Their first son had been born malformed and survived several days before dying. The Kid, in its opening scenes would give the Tramp a baby, abandoned by the unhappy mother. In a moment of delicious nastiness, the Tramp hooks open the gutter drain with his cane, looks at the baby, then the open drain, then the baby, before glancing straight at camera and giving up on the idea. What would have happened if we hadn’t been watching? And yet there’s also complicity in the glance. Don’t tell me you didn’t think it wasn’t a good idea. Luckily though, the Tramp decides to bring up the baby and Jackie Coogan (later Uncle Fester in television’s The Addams Family) playing the five year old proves a brilliant foil to the most famous movie star in the world. Their relationship is one of almost equals, in their business partnership – the Kid breaks windows that the Tramp then repairs – and in their domestic arrangements as the Kid proves a competent cook and the Tramp sees to his personal hygiene. Chaplin used memories from his own upbringing in Dickensian level poverty. When the authorities come to separate the Kid and his surrogate father, the desperation and grief that suddenly burst through the screen are unexpected and rooted in authentic trauma. It’s interesting that this is not the end of the film but the middle. Comic business can continue with a brilliant fight with the street bully and a daft dream sequence to literally allow the film to take flight from its humble setting, but the emotional core of the film is actually a drama about paternal love. Following the critical success but commercial failure of A Woman of Paris (1923) – the first film Chaplin directed but didn’t star in – Chaplin returned to the Tramp and comedy with The Gold Rush (1925). As with all of his comedy, Chaplin took his inspiration from potentially tragic circumstances – in this case the gold rush of the title mixed in with the infamous Donner party that was trapped in snow in the mountains and resorted to cannibalism. The everyday poverty of urban life is now replaced by the extremes of deprivation and starvation caused by the desperate attempt to escape poverty. The Tramp (or the Lone Prospector as he appears in the titles) finds himself stuck in a shack with a mad prospector, Big Jim (Mack Swain) and a criminal Black Larson (Jim Murray). The weather and the precarious hut make for much comedy, but it is hunger itself with Chaplin eating his shoes, or dreaming up the dance with the rolls which is key. Like the baby and the drain, Chaplin’s humour is shot through with darkness, loneliness and violence, like chili pepper in chocolate. Another foolish marriage to a teenage actress was unravelling while Chaplin shot The Circus (1928), but this is his lightest feature of all and perhaps his funniest. The whole film was inspired by one idea – a man on a tightrope, covered in monkeys – and it is brilliantly realised. The Tramp finds work in a circus as a prop man but is unintentionally a comic hit. There is some sadness in the troupe of unfunny clowns being superseded, the way Chaplin himself feared that the imminent move to sound would render his own work irrelevant, and some heavy-handed melodrama as the cruel Ringmaster and his beaten daughter Merna (Merna Kennedy), but it is the physicality of the comedy and the death-defying stunts involving a lion and mad mule as well as the monkeys and tightrope. Seeing the risks and athleticism of Chaplin’s performance it’s difficult to believe, as David Robinson asserts in his landmark biography, that Chaplin’s first broke a bone in his sixties. The very first Academy Awards in 1929 took The Circus out of the nominations but gave Chaplin a special award for ‘versatility and genius in acting, writing, directing and producing’. Regardless of the stupidities that were to follow in Hollywood’s treatment of the great silent comedy star, these words ring as true today as they did then.